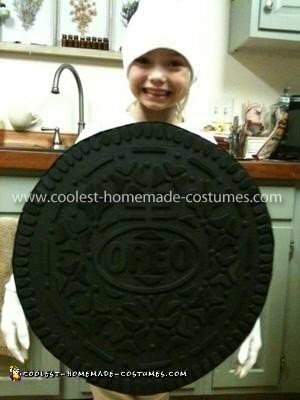 Oreo cookies are my daughters favorite, so what would be better than an Oreo Cookie Costume!. I cut the “cookie” pieces of out card board and painted the insides black and then enlarged the details of the cookie and traced them on black foam sheets. I used 3mm thick foam sheets and cut all the pieces out to get the raised effect. I then glued them onto the cardboard and painted the whole thing black. I attached the “cookie” pieces with an elastic band (the kind you find in sweatpants) and made straps to go over her shoulders. I then hot glued a sheet of white felt in between to get the filling. I had my daughter dress in all white to complete the look! She looked good enough to eat! 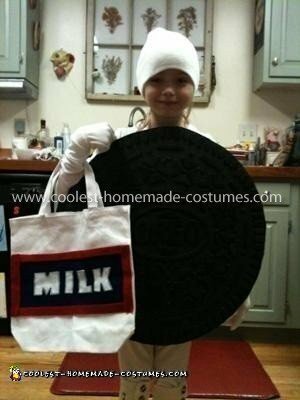 I also made her “milk” trick or treat bag, I bought a white canvas bag and glued on the pieces of felt (cause you can’t have Oreo’s without milk!). Are you looking to sell by any chance? If so, please contact me on my Pinterest page (Ath Vas). Thanks! Would you be willing to sell this costume?